It’s no small thing turning the calendar from one year to the next, and with 2019 arriving at warp speed, we got to thinking about all the awesome eats from 2018 that we’d want to munch on as we ring in the new year. 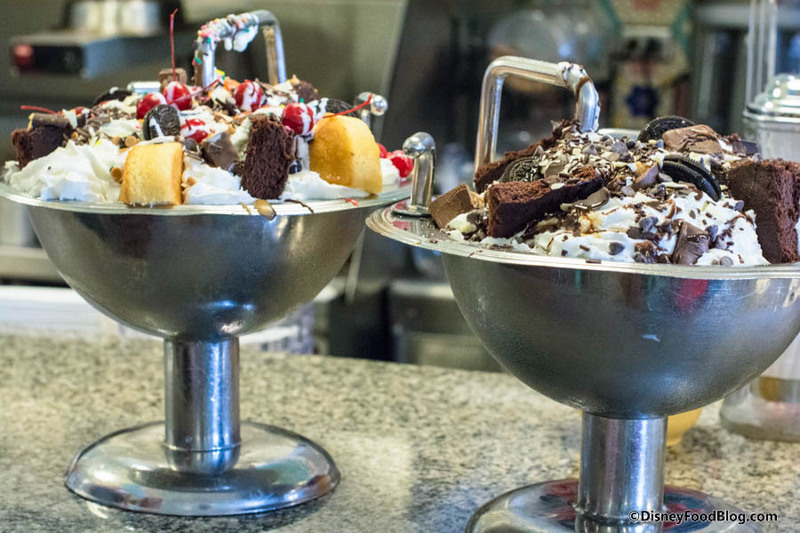 Here are our picks for Five Awesome Eats You’ve Gotta Get in 2019 in Disney World! 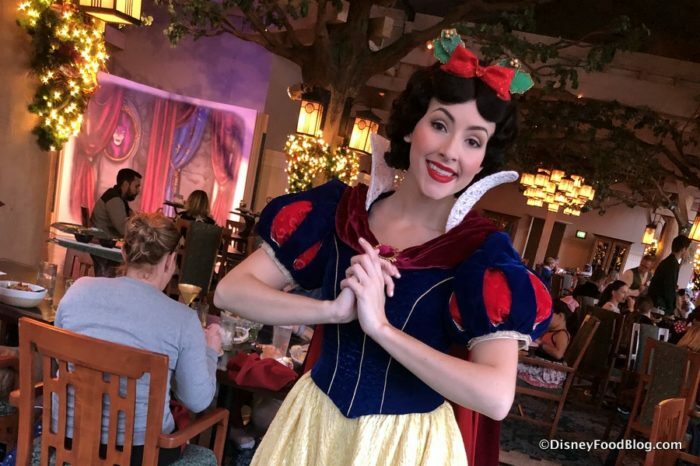 Nothing says Walt Disney World quite as much as dining with fairy tale characters, and the brand new Storybook Dining experience in Artist Point at Disney’s Wilderness Lodge Resort is one such dreamy meal. Happy New Year, Snow White! Happy Sunday! We hope you’re having a wonderful weekend! Now it’s time to kick back, relax, and catch up on another week of Disney food news! The 2018 Epcot Festival of the Arts is happening now through February 19, and we have all the Food Booth menus and food photos! See our Best of the Fest here!! It’s time to buy the 2018 DFB Guide to Walt Disney World Dining! Use code WDW2018 at check-out to get 25% off the cover price! Animal Kingdom’s Party for the Planet will include MORE food this year! Corn Dog Nugget Nachos are back at Whitewater Snacks in Disneyland for a limited time! We reviewed ALL the Lunar New Year eats at Disney California Adventure. We reviewed the Mardi Gras Beignets at Disneyland’s Mint Julep Bar. Ballast Point Brewing is coming to Disneyland’s Downtown Disney District! Check out our latest review of Flame Tree Barbecue at Disney’s Animal Kingdom! AJ has a new favorite dessert – Toffee Bread Pudding at the House of Blues in Disney Springs. 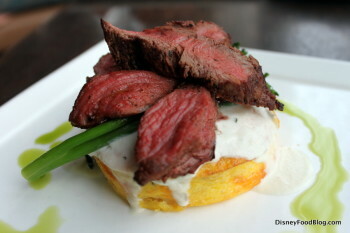 We have a review and tips for Cinderella’s Royal Table. Splitsville is opening at the Downtown Disney District on January 29! We shared a tribute for Chef Paul Bocuse. New DFB YouTube videos: 11 Things Disney Pros Do, and You Should Too and 5 Disney Drinks to Get in 2018! I know it’s hard to believe, with so many truly delicious bread puddings available at Walt Disney World Resort (‘Ohana Bread Pudding at Polynesian Village Resort, Butterscotch Bread Pudding at Plaza Restaurant, Ger’s Bread Pudding at Raglan Road — to name a few crowd pleasers! ), but we totally have a new favorite! 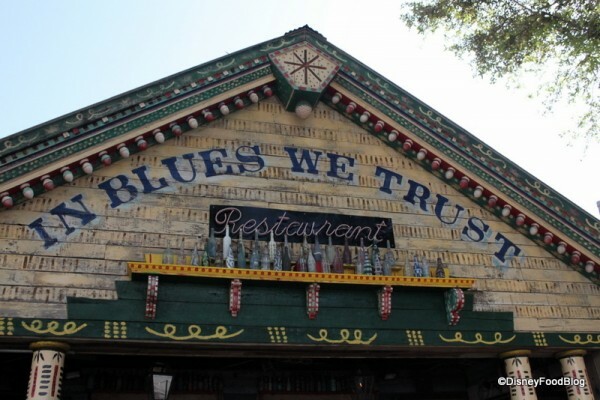 You can find it at House of Blues in Disney Springs’ West Side!